A recent donation to the Scarborough Maritime Heritage Centre by Liz Murphy is a painting of the steam trawler Ratapiko by an unknown artist. The vessel has had an interesting and varied history. She was built in 1912 by the John Duthie Shipbuilding Co. Ltd, Aberdeen as a steel steam trawler, gross tons 247. She was powered by a 79hp T.3 cylinder engine manufactured by W.V.V. Lidgerwood & Co Ltd of Glasgow. She was 120.3ft long with a breath of 22.6 ft and had a depth of 13.6ft. The first owner/manager was John G. Smith of Fleetwood and she was registered in Aberdeen as A446. In August 1914 on the outbreak of World War 1 she was requisitioned by the Royal Navy and converted to a minesweeper (Ad. No. 347) based at Granton on the Firth of Forth. On the 19 Sept 1916 she was deployed on Special Service using the name “Lennard”. She was armed with one 12 pounder gun and one 6 pounder AA gun. She was probably used for protecting the fishing fleet. During WW1, 1456 trawlers were requisitioned by the Royal Navy to work as minesweepers and armed trawlers of which 266 were lost, 142 by enemy action. On the 7 October 1916 she went to the assistance the Hartlepool steamer “Jupiter”. This vessel was on passage from Archangel to Hull with a cargo of timber when she was stopped by a German Submarine (UB 27) 40 miles NE by E from the Longstone Lighthouse . The vessel was scuttled but she failed to sink and was taken in tow by “Lennard”. She towed her into the Firth of Forth. On January 30th 1918 she was escorting a Convoy (TM15) in thick fog when she became stranded on the Longstone Rock, Farne Islands. Salvage was hampered by bad weather. She was eventually refloated and taken in tow by tug for Blyth Northumberland. She returned to service after repairs on the Tyne and operated as a decoy trawler (using the name “St George” SN49) working in company with HM Submarine C.24. Decoy trawlers (also known as Q ships) were intended to lure German U Boats to the surface where they could be engaged by gunfire. When working with C class submarines, the trawler towed the submerged submarine communicating by a waterproof telephone line. The aim was to give the impression that there was an unarmed trawler so the U boat surfaced intending to sink it by gunfire. The C class submarine then surfaced and engaged the U boat. At least 6 U boats were sunk using this tactic but others were probably badly damaged and others deterred from surfacing. This tactic was abandoned late in the war following the loss of two C class submarines when they became entangled in the towing line. 51 fishing vessels (steam trawlers, drifters and fishing smacks) were used as decoys of which 11 were lost. 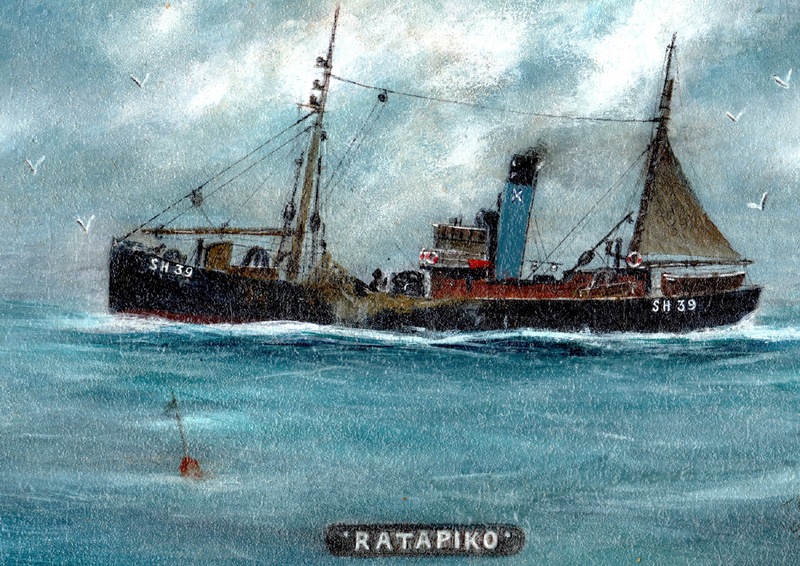 There is evidence that Ratapico, working with C24 did engage a U boat but did not manage to sink it. In November 1918 she reverted to being an armed trawler before being returned to the owners in 1919. She was then owned by Stepney Steam Fishing Co. Ltd and in 1920 was registered in Scarborough as SH221. She was deregistered and converted to a cargo vessel with the winch removed and fitted onto the steam trawler “Magnolia” SH39. In 1926 she was converted back to a trawler and passed into the ownership of Thomas Harrison Scales, Newhaven, Edinburgh and was registered In 1939 she had a new boiler fitted in Scarborough as SH39. In 1935 she was registered at Leith as LH86. In the Second World War, she was requisitioned in 1940 and converted to a minesweeper (FY 1878) on a hire rate of £61.15s 0p/month. She continued as a minesweeper through out the war, a less exciting but very important duty. She was returned to her owners at the end of the war. In 1947 she was owned by Kelvin Trawlers Ltd of Aberdeen and renamed “Kelvingrove” and operated as a fish and liver carrier before returning to trawling in 1948. In 1956 she was sold as scrap to British Iron and Steel co for £4150 and was broken up at Charlestown, Fife.